So, you want to start an Amazon affiliate website and make some money online, well you have come to the right place, after many trial and errors, I run a relatively successful website that is mostly monetised through the Amazon associates program. I am not making huge sums of money, but it pays the bills and hopefully this guide can help you get started with building an Amazon affiliate site of your own. From selling books to selling nearly everything, Amazon has come a long way since its humble beginnings in 1994. Last year alone it did over $130 billion in sales and a percentage of that goes to its huge number of affiliates. Amazon boasts one of the largest affiliate programs in the industry and is the entry point for many aspiring affiliate marketers. When I was first introduced to affiliate marketing, I was told that making money through Amazons affiliate programme was not worth it because of their small commission rates. I was told to make huge commissions you had to promote products that are expensive, this silly advice was from MLM a company I had joined. So, I was reluctant to join the programme and was always looking for affiliate programmes that offered huge commissions. Luckily for me, there are a lot of famous bloggers that promote the Amazon affiliate programme and provide excellent guides on how to make money with Amazons affiliate programme. So, after reading the positive aspects of starting an Amazon niche site, I created one myself. So, what is an Amazon affiliate site? Basically, with Amazon affiliate sites, people write about and promote products that are sold on Amazon, because Amazon sells nearly everything, you will not be limited by choice. Most sites that are primarily monetised through the Amazon associates program contain a wide range of articles, these include review articles, how to guides, tutorials, comparison articles, best of articles, listicles etc. Gone are the days of small Amazon niche websites that could be easily ranked on Google by blasting hundreds of backlinks. Google wised up, its ranking algorithm went through some major updates ( think Penguin and Humming Bird, no idea why they chose those names) and a lot of sites that were thin on content were deindexed overnight and many people saw their income vanish without warning. This is why an affiliate site must be more than just writing review articles trying to sell people a product, that can still work, but it will be better to build a website that provides more than just reviews. You want to build a brand, a real online business that people can trust and one that has people coming back for more. That way it will be easier for you to sell them products because you have already built a trusting relationship. Wirecutter – probably the most famous one of all because of its rapid rise. Founded in 2011 by former writers of several online publications, the site was sold to the New York Times for a whopping $30 million in 2016. PCMag – If you have ever searched for a review on any of the latest electronic products, most likely you will have come across this site. Although they do not solely rely upon Amazon, it is a huge part of their business. Personally, this site puts me off because of all the ads that slow it down. Tech advisor – Another site like PCMag, makes money through both Amazon and AdSense. These sites get millions of visitors a month, although most of us will probably not come anywhere near their popularity, it’s good to know what is possible. The following are successful Amazon sites that anyone can model their own sites after. All these sites are successful because they have great content that satisfies customer queries. So, now that we have had a brief look at some successful Amazon affiliate sites,we will move on to how to create one ourselves. Before proceeding with anything else, you need to find your niche, something you could build a website around and something you are willing to promote. I would always advise that you find something you are knowledgeable in or passionate about, this is because it will be easier to create content around something that you know a lot about. However, if you are motivated to becoming a successful affiliate marketer, then it shouldn’t matter what niche you decide to get into as long as you are willing to put in the time and effort to learn about it. I researched a lot of products and found a few profitable ones and created a PDF document that lists over 1000 keywords in 20 niches, please feel free to download it and use for your own research. Although the research took time, my process of finding profitable niches that will be easy to rank on Google is simple. 2.Find a category you are knowledgeable in or would like to promote. 4.Look for products in that category that have over 50-star review. The more reviews it has, the more likely it will have a significant amount of search volume on Google and other search engines. Have a search volume of over 50 per month. Search results that have forums and YouTube videos gives you a better chance at ranking your posts. If the monthly searches for your chosen products are negligible, then try keywords that are related. For example, Linenspa makes mattress protectors and they sell well on Amazon. If I search for the term‘linenspa waterproof mattress protector’ it gets less than 20 searches per month. 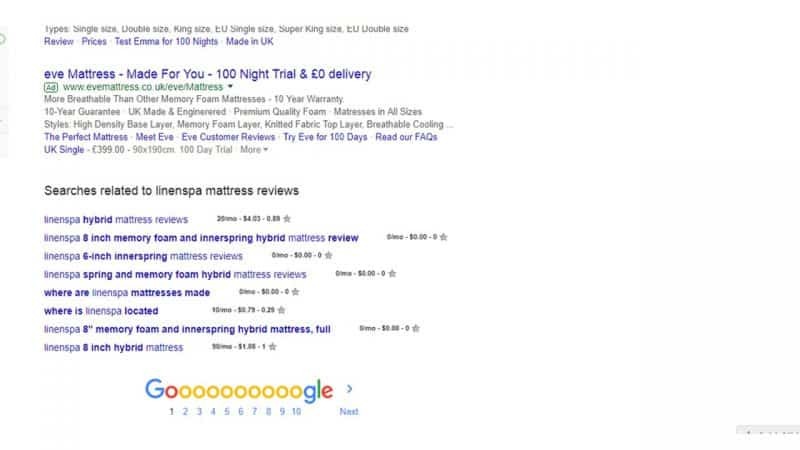 However, if I search for ‘best waterproof mattress protector’ it gets over 200 monthly searches which makes it a high enough search volume to try and rank the keyword for. Why would you target the keywords above? because they are buying keywords, people who search using terms like ‘best‘,‘cheap’,‘review’ are looking to purchase but need a bit more information and that is where you come in. 6.Make a list of all the products and keywords that meet the above criteria. Related keywords are called LSI keywords,LSI (Latent Semantic Indexing) is a mathematical method that determines the relationship between terms and concepts in an article. Search engines will crawl your content and use this method to determine how the title of your web page is related to the rest of the content and this, in turn, has an effect on how well you rank and what keywords you rank for. I don’t really want to get into the technicalities of this, but if you would like more information on how using LSI keywords can help you to rank, read this article by Search Engine Journal. An example of LSI keywords is shown below. That’s it!! The steps are simple but it takes time,but if done properly,you will build yourself a lasting online business. I found several niches that looked really promising before I settled for the one that really interested me. Although I will not reveal my niche, I will provide one of the niches I strongly considered and that is wireless headphones and speakers. Not only is this a great niche but because is always evolving it is also an evergreen niche. From commuters to gym fanatics, headphones and speakers will always be in demand. 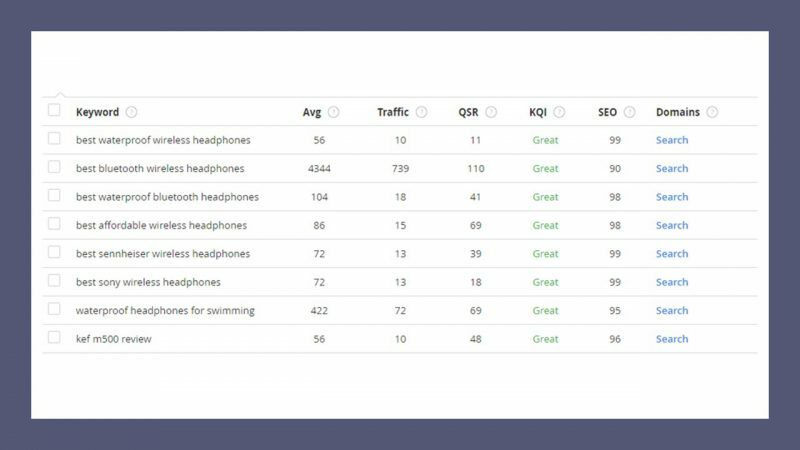 Wireless headphones and speakers get over 550,000 and 110,00 monthly searches respectively. So the market is huge, but it is highly unlikely that you will get ranked for these terms. The keywords you want to rank for are more targeted. The keyword data is from Jaaxy keyword tool, the competition for these keywords are really low and they are very targeted keywords. The search volume may be low, however, the more articles you write the more keywords you will be targeting and you will not only target those keywords but your content will have related keywords that will also start to rank. Next, we will look at the top 10 results for these keywords and analyse whether or not we can outrank the websites that are currently there. Because keyword data is not based upon exact science, there are flaws and sometimes keywords that seem easy to rank are in fact not. This is why sometimes extra analysis is required to see if your chosen keywords will be easy to rank. 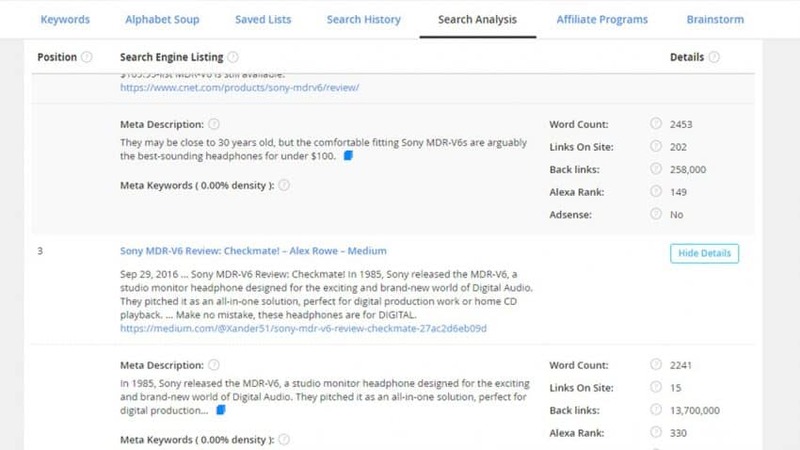 For example,let’s take the keywords ‘sony mdr v6 review’ and punch it into Jaaxy and analyse the results. According to Jaaxy, it has a great KQI score which means it should be easy to rank. The Google search results for the search term are shown below. Most of the results are broad technology websites that can be outranked and there are even reviews on Medium ,forums and YouTube ranking on the first page. These meet our criteria for finding keywords that have weak competition and will be easy to rank. Your next task is to go through each review and see how they are structured and the length of the content. This can be a bit tedious but you will have a good idea of what it kind of content it will take to rank on the first page. This task can be made easier if you have access to Jaaxy keyword research tool,there is a search analysis feature within this tool that will give you information about the top 10 results. 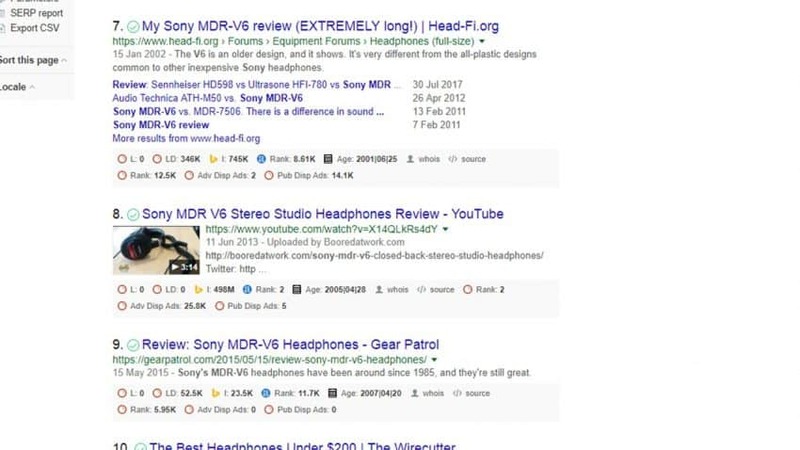 For example, if I wanted to know the content length of each of the top ten results of the search term ‘sony mdr v6 review’ ,instead of manually going through each post and having a guess how long each piece of content is, I can look it up using the Jaaxy search analysis feature. As the image above shows, the length of content for the second and third results on Google are 2453 and 2241 respectively.This feature also provides you with other data such as the no. of backlinks the page and website has,its Alexa rank and meta description. Your final task is to write the content. Make sure the content is better than what is already out there or at least matches up with the top-ranked posts that are ranking for the keyword you will be targeting. How will you know if your content is good enough? By writing it and getting some honest feedback. I used to think I cannot write a better more engaging article, this came down to confidence issues and I know a lot of people will feel the same. The only advice I can give is not to over think this stuff and just take action, the only way to get better at something is to give it a go. Remember, great content also is a ranking factor, Google will notice if people decide to exit your site if the content doesn’t meet their satisfaction. Make sure that your content length is the same as those on the first page of Google and make sure to always insert relevant images and videos. However, if you seriously hate writing (like me, but I still do it anyway) you can always outsource this part of your Amazon affiliate site. I have tried a couple of content services and both were hit and miss, there are a few I would recommend. Textbroker – Like iWriter they have several tiers and you will get very good quality at the highest tier which is expensive. My recommended service is Contentbeasts,they do not charge as much as the other two services but they do provide high-quality content at affordable prices. So after you have done all your niche research and have your content ready, whats next? building your website!! The best way to promote products on Amazon is through your own website, they have a strict policy on ways you can promote your Amazon affiliate link and if you are caught violating any one of them, it could get you banned. Building your own niche websites is one of the recommended ways and I believe the best way. You will need to register a domain name first, there are many domain registrars but one of my favourites is Namecheap. I usually go with Namecheap because they are the cheapest registrar and you get one year free of WHOis guard. This protects your identity if people want to look up who owns a website. To register a domain name with Name cheap click here. Make sure that you choose a domain name that can be branded and one that is associated with your niche. Also, try and get a top level domain like .com,.org or .net. I have found the best and easiest way to create beautiful websites is through WordPress. I have written about why WordPress is so popular and one of them is that it is easy to learn. There is a boatload of free tutorials on YouTube that will teach you how to set up a WordPress website. There is also a free course on affiliate marketing with Wealthy Affiliate which covers creating websites with WordPress, this free option also allows you to create two free WordPress websites with their SiteRubix hosting platform. All websites need hosting and there are many good hosting platforms, however, there are certain hosts who have optimised WordPress hosting and one of my favourites is BlueHost. I know a lot of people have issues with Bluehost, I personally never had any problems with them and the fact is that WordPress actually endorse them as one of the best web hosts optimised for WordPress. The most you will pay monthly for any of these shared hosting accounts will be no more than $10 per month. After you have created your site and filled it up with your content, apply to become an Amazon affiliate, you usually get accepted pretty quickly. The number one reason I have found that Amazon sometimes rejects people as an affiliate is because the quality of content is not good enough. So always make sure that your content provides value for your visitors and that it isn’t plagiarised material. Your next task, after you have been accepted, is to insert affiliate links in your content. Don’t stuff affiliate links everywhere, do it so that it looks natural. Now, the best way to insert affiliate links in your content that will result in better conversion rates is beyond the scope of this article, which is why I have listed some recommended training below. To get some quick traffic, make sure to add social sharing buttons on all your posts and share them on your social media accounts. Of course, it’s all well and good if you already have experience with building websites but maybe you are completely new to this and need a bit more guidance. Luckily there are tons of resources on the internet on how to build successful Amazon affiliate sites. I have already listed some of the websites that inspired me to create an Amazon affiliate site. They have fantastic free training guides on affiliate marketing and they consistently publish quality content. Here are a few more I would recommend you visit to learn more about building quality Amazon affiliate sites. If you want an all in one platform to learn affiliate marketing, then I highly recommend Wealthy Affiliate, they provide everything for you under one platform. You will get access to a host of features at an affordable price and this includes a premium keyword research tool that retails at $49 pm and premium WordPress hosting. Don’t make the mistake I made and disregard Amazons affiliate program because of its low commission rates. The reason why the Amazons affiliate program is so good is because Amazon converts its customers better than any other online retailer. So, your job as an affiliate marketer is to provide brilliant content that will attract a lot of traffic, a percentage of which will click through to Amazon. Remember content is king, don’t give up after writing 10-20 articles and not seeing any results, aim for at least 150-200 within your first year and see where you are then. Affiliate marketing is an awesome way to start an online business, it just takes time and a lot of effort, I really believe you can do it, just do not fall for get rich quick schemes and do not give up on the first sign of failure. I would love to hear your feedback and any other advice you would give to Amazon affiliates. Earning some good money from affiliate programme is the best opportunity. Thanks for helping people by sharing your knowledge. Thanks for stopping by and commenting, glad you enjoyed my article. Thank you for stopping by and commenting, I am glad you found it useful. I will be continuously updating this post with more information on how to become a successful Amazon affiliate. Wow, you have really explained it. I am thinking about joining Amazon Affiliate program for some time now but every beginning is difficult, so this article has been very useful to me. Thank you! Great information very informative, your readers will love what you are sharing and will learn a lot from your post. Awesome! So many people have trouble with this so this is great. Thanks for the impressive low down on this part of e-commerce. I had absolutely no idea about this. So informative! I have never tried Amazon, but from this review, I need to check them out. Excellent ideas man. I already have a Website so now I am just looking for some good affiliates to link with. I think Amazon is the perfect fit. It has all the products I review and their accessories. Thanks for the tip on searching for new products to write about. I will be looking in the amazon’s best seller for my next review idea. Great Post Thank You. Good Explanation. Wow, thank you for sharing all of this information. You have given me a lot of work to do. I am already an Amazon affiliate but now need to make it work for me. You have given me some great ideas on how to improve my sales. I most definitely need to work on my Keywords and will be giving Jaaxy a go. Is this the best Keyword tool for a beginner or is there something else I could use?